Three weeks of ridiculously giddy flying for anyone who has always thought, "that looks fun!" Bouncing, flipping and making shapes disguise the muscle building and core work involved in both close-to-the-floor and mid-air bungee dancing. Sonya Smith is the first to complete the Aerial Track of the MFA in Dance from the University of Colorado Boulder. 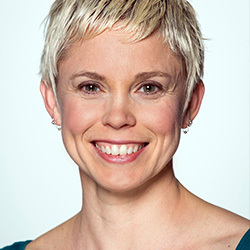 A scientific artist, Smith has accumulated somatic information from Alexander Technique, Kinesiology, and athletic training as well as a certificate in Pilates and a Gyrokinesis Apprenticeship. Smith's curiosity about the body and effective training methods for aerial and ground-based dancing is insatiable. Performing in San Francisco and producing work in multiple cities, she combines a passion for highly physical dancing and a quirky theatricality both on the ground and in the air, weaving together Contact Improvisation, bungee and harnesses, lyra, and a variety of invented aerial apparatus. Smith spent a decade studying and dancing in with Joanna Haigood/Zaccho Dance Theatre, Project Bandaloop, Jo Kreiter/Flyaway Productions, Sara Shelton Mann, Eat Cake Productions, and Terry Sendgraff before returning to academia where she has continued to earn residencies and produce work around the country. Aerial yoga is a combination of traditional yoga poses and postures practiced using a soft fabric suspended at waist height, allowing students to achieve proper postural alignment in exciting new ways. In our classes, you will learn exercises that will promote a deep understanding of your body through an adventurous and restorative practice. You develop core, upper and lower body strength, flexibility, motor dynamics, spinal alignment, endurance, reflex response, balance and somatic awareness. We are often full, so we advise you to sign up before class. This is great for all students who are new to Aerial Yoga and are interested in learning the basics. 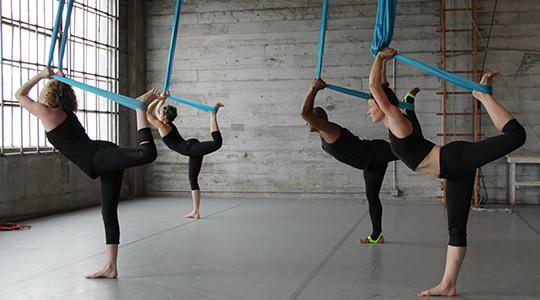 Ease your way into your practice by familiarizing yourself with the aerial hammock, learning the correct form and alignment, and build the strength to take your poses off the ground. This class is designed for students who already have a regular Aerial Yoga practice and are familiar with the aerial hammock. This class will focus on developing collective movements, trying new and challenging postures, and mastering the basics.